A dynamic approach to identify and trade cycles that influence financial markets. This book reveals new algorithms to identify cycles that drive financial markets. Learn about how to properly detect tradable cycles in markets, how to use that information to improve technical indicators and how to forecast using cycles. Watch as we step through many trading examples using these tools. The book provides solid knowledge on a new cycle analysis approach and ways to use it in the trading world. Included is the methodology behind the implemented tools along with concrete examples of how to put cyclic analysis into trading practice. This approach is different from traditional cycle approaches in that this is the first time that a dynamic approach to cycles has been presented. WhenToTrade Charting Platform, WhenToTrade API integration or Wave59 Cycles Plug-In is available as an optional add-on to use the tools in a standalone real-time environment without coding requirements. The newly revised 3rd edition “2017”comes with free ready-made downloadable source code and indicators for NinjaTrader, MetaTrader, C++, Excel and cloud-based API integrations. 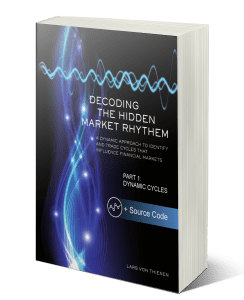 How to detect cycles in the stock market using algorithms that can deal with the special characteristics of financial timeseries. Static, semi-static and dynamic dominant cycle forecasting techniques. See why static cycle forecasts fail on the right side of the chart. Learn the importance of dynamic dominant cycle updates. Use sentiment cycles to spot turning points in the markets. Validate cycle forecasts with inter-market cycles. Anticipate the next turn based on measuring cycle momentum with no lag, sharp and leading cycle momentum indicators. Bar-by-bar video lessons for each chapter. Additional real-time forecast reviews and video guidance. Step-by-step trading examlples for daily and intraday on S&P500, Dow, Silver, Gold and Forex.